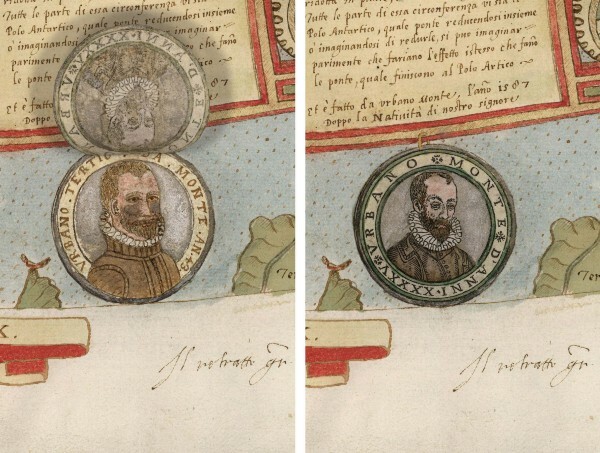 Detail of Tavola XXXXII (Antarctica, Urbano Monte Portraits of 1587 and 1589). The encounter with the Japanese embassy inspired Monte to undertake an ambitious project that would consume his efforts for the next twenty years: the Trattato Universale, a four-volume compendium and geographical treatise that attempted to showcase the entire geographic knowledge of the world. 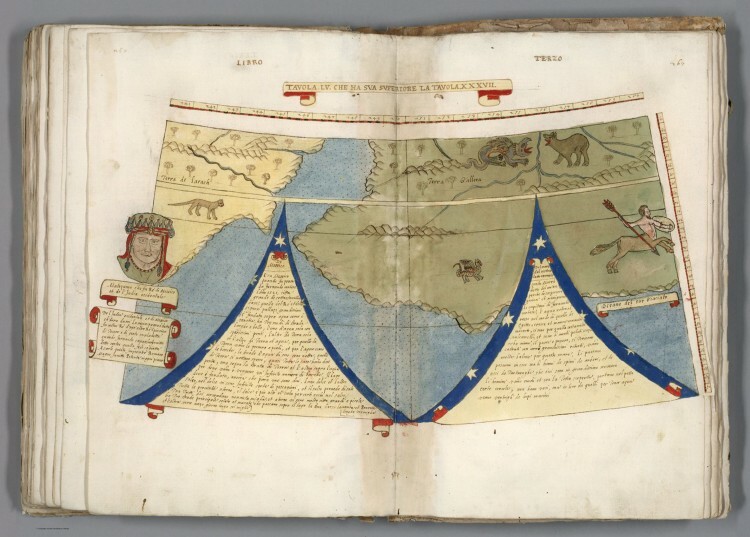 The third volume of the Trattato contained his most impressive and innovative work: a map of the world across sixty individual sheets that, were it to be stitched together as his instructions dictated, would be the largest world map made in the sixteenth century. But Monte’s project was largely forgotten by history, and his life and work rarely studied. 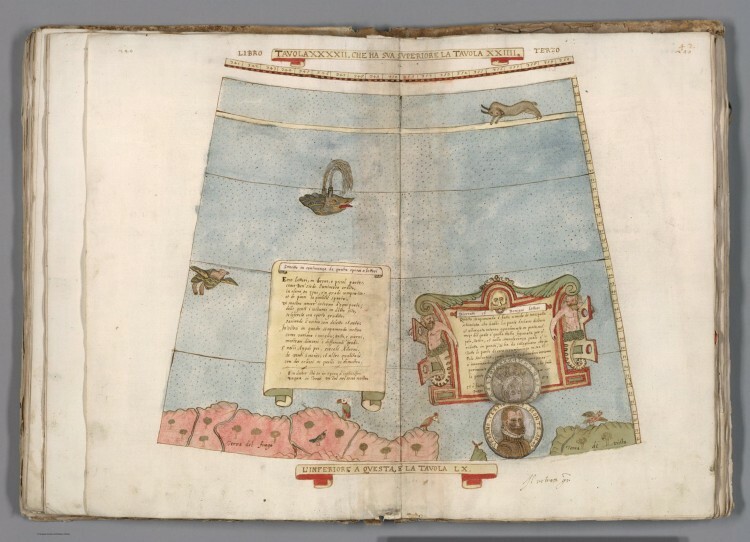 His world map was hidden away in an atlas for centuries, the bound pages belying the visionary scope contained within. 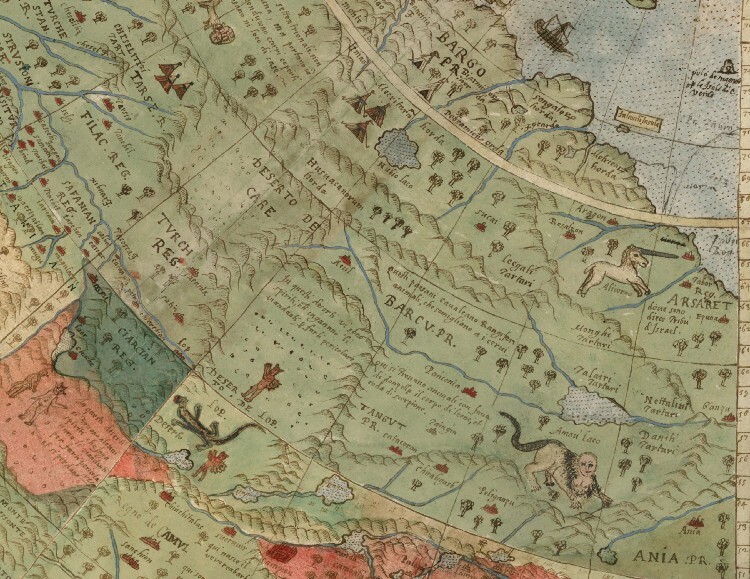 In September 02017, David Rumsey, a map collector and Long Now’s Treasurer of the Board of Directors, acquired the map from antique map seller Barry Ruderman for the Rumsey Map Center at Stanford University. Now, the Rumsey Map Center is bringing Monte’s vision to life. Rumsey’s team has digitized and assembled the sixty sheets into a single world map that stands a remarkable nine feet in diameter. The map is extraordinary for reasons beyond its size. 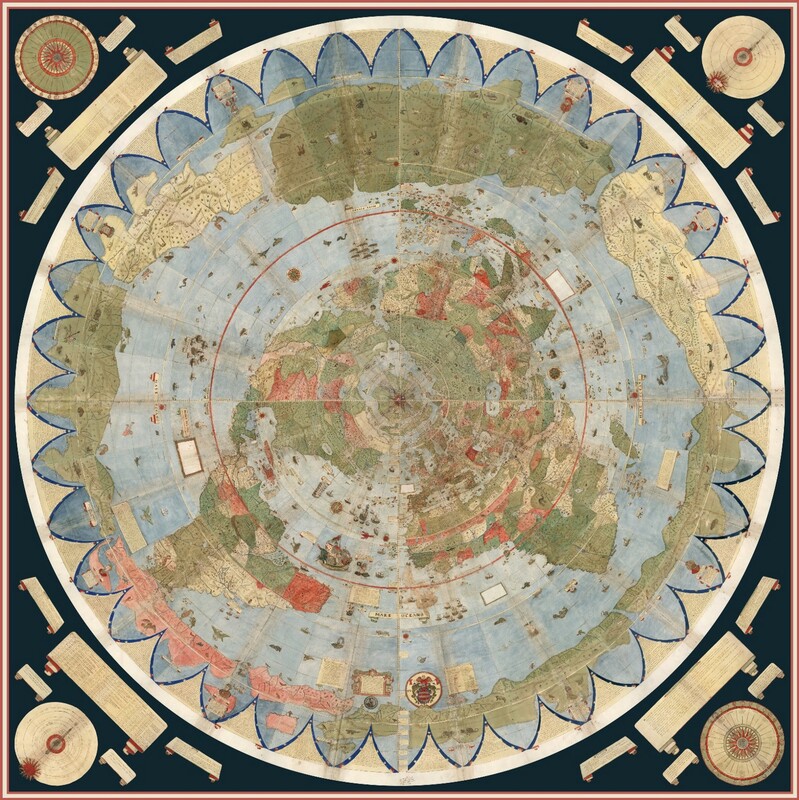 It largely eschewed the Ptolemaic modes of representation that had held sway in mapmaking since the time of the Greeks in favor of contemporary cartographic sources. And, in an unusual choice, Monte used polar azimuthal projection, portraying the spherical Earth with the North Pole at its center — a perspective seldom used in mapmaking until the advent of air travel in the 20th century, most notably on the emblem of the United Nations. 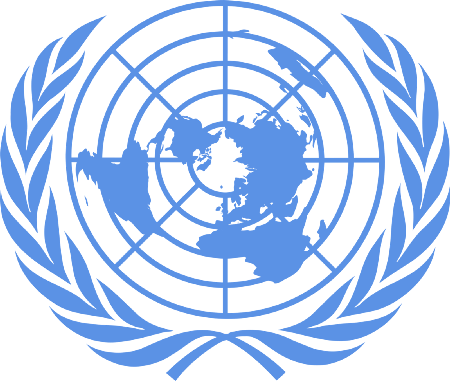 The United Nations emblem, top, and the Urbano Monte planisphere, bottom. 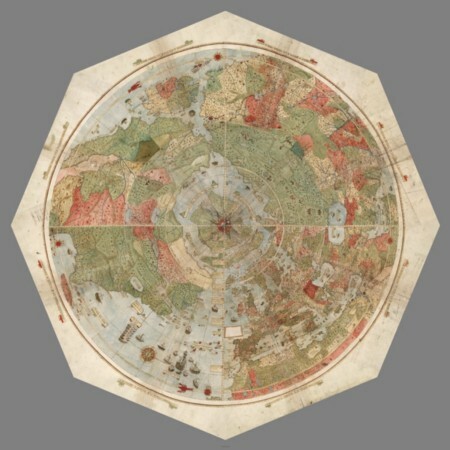 With the advent of circumnavigations, the trade to the East Indies, and the encounter with the Americas, the known world of Renaissance scholars literally expanded, necessitating new ways to depict the round globe on a two-dimensional plane. Compared to the better-known and more widely-used Mercator projection, Monte’s azimuthal projection has the advantage of accurately displaying the relative size of continents in the Northern Hemisphere, whereas Mercator’s exaggerates the size of land masses like North America, making it seem larger than Africa when it is in fact three times smaller (As has been noted elsewhere, this artifact of the Mercator projection has had significant social and political implications). Like the Mercator projection, polar azimuthal projection results in distortion around the South pole and Antarctica. But as Greg Miller writes, this was in line with the cartographic thinking of the time. “Most cartographers thought [Antarctica] had to be massive to counterbalance the large landmasses to the North,” Rumsey says. Each region contains notes and images that nod to the location’s myths and histories. Japan in particular contains numerous place names not seen on other maps of the time — an indication both of Monte’s interest in the region and the likelihood that he was given access to Jesuit knowledge of the terrain after the visit by the Japanese embassy. 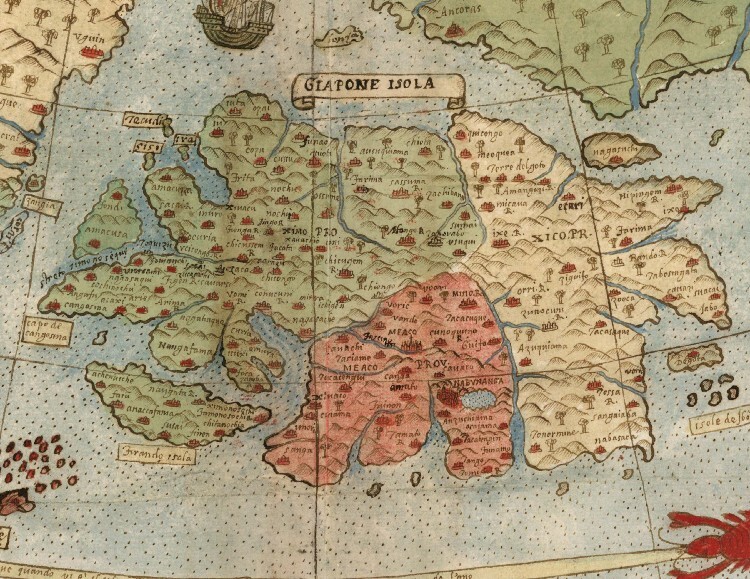 Like many mapmakers of his era, Monte chose to fill in the blank spaces of his map, which teems with with mermen, unicorns, griffins and large birds. Chet Van Duzer, a renowned History of Cartography scholar, has written extensively on this tendency in mapmaking, which he argues is motivated by horror vacui — a fear of empty spaces. 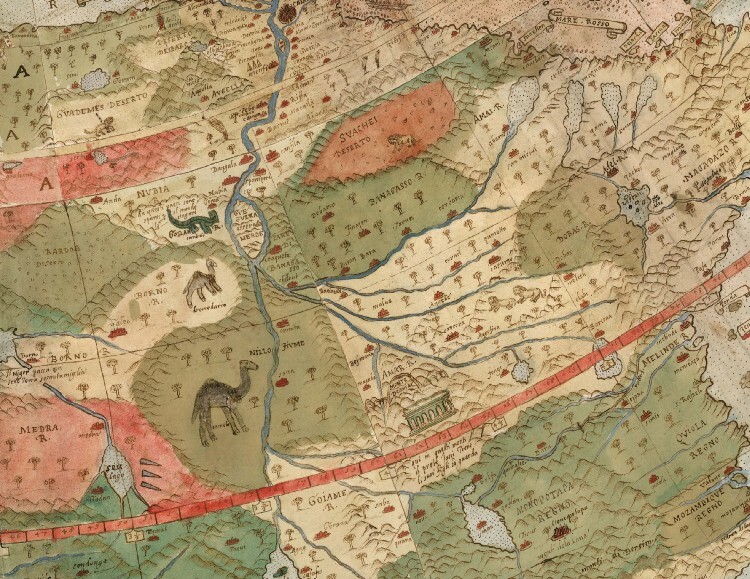 Van Duzer theorizes that the monsters that persisted among so many sixteenth century maps could be an attempt by mapmakers to hide their ignorance, or to increase the market value for their works (Wealthy patrons preferred lavish decorations). 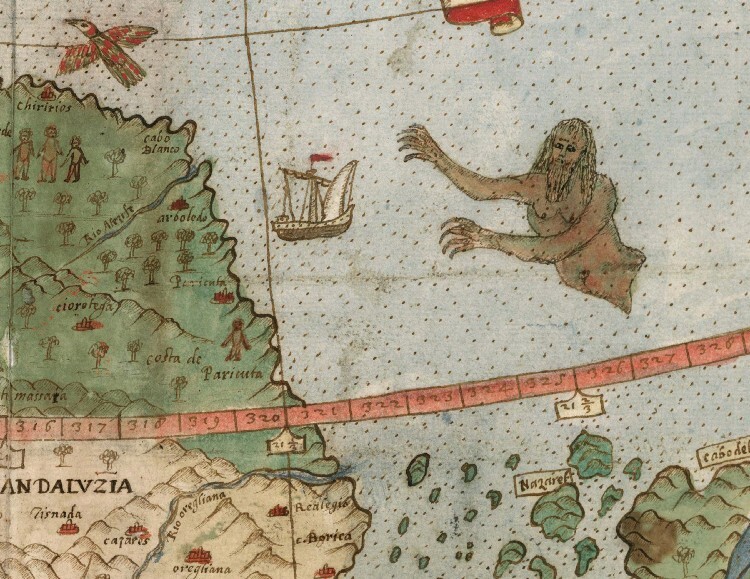 As maps transitioned from ways of illustrating cosmic principles (as in the medieval mappa mundi) to being reliable instruments of navigation, the sea monsters disappeared. It is an unusual and remarkable map, far ahead of its time. Now, thanks to advances in technology, and 430 years after it was first envisioned, viewers can finally see the world as Urbano Monte intended. The map is viewable online and to visitors to the Rumsey Map Center. In December 02017, Chet Van Duzer began a three-month research fellowship at the Rumsey Map Center to study Urbano Monte’s map. 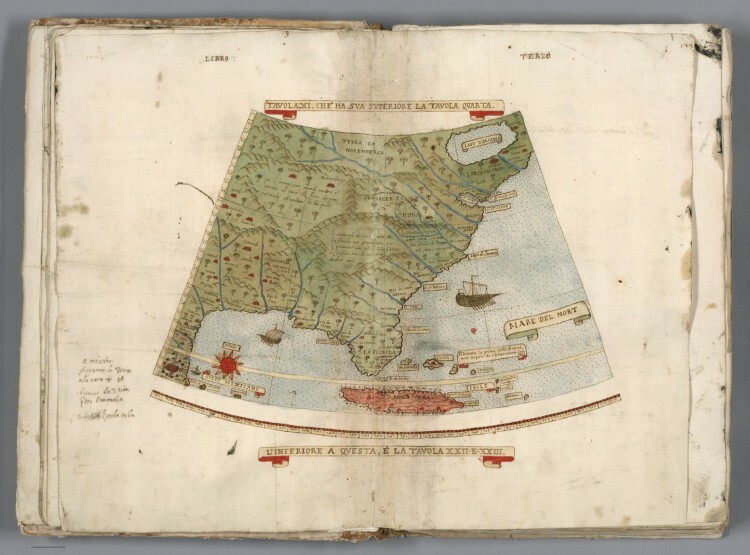 On February 23, 02018, Van Duzer will present his findings in a talk, “Making the World Go ‘Round: How Urbano Monte Created His Map of 01587.” The talk is free to attend, but registration is required. Explore the Rumsey Map Center’s digitized version of the Urbano Monte map. Read a joint publication by Barry Lawrence Ruderman Antique Maps and the David Rumsey Map Center on the Urbano Monte map.